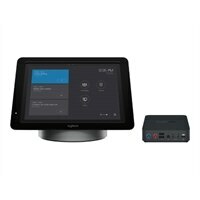 Logitech SmartDock - Video conferencing kit - with SmartDock Extender BoxWalk into a conference room and instantly launch your meeting using the high performance, easy-to-use Logitech SmartDock. Transform your meeting with a rich experience. Meeting organizers enjoy the familiar interface, and IT admins appreciate the easily deployed and managed meeting app. This Logitech SmartDock is only usable as part of a Skype Room Solution. Additional pieces must be purchased and installed to complete the solution. Items needed: Logitech SmartDock; Microsoft Surface Pro 4 with Intel Core i5; Microsoft Windows 10 Enterprise; Microsoft Skype Room System App from the Microsoft Windows Store; Skype Certified Audio and Video Devices, such as Logitech ConferenceCam Connect or Logitech GROUP. Complete solution packages are available. Walk into a conference room and instantly launch your meeting using the high performance, easy-to-use Logitech SmartDock. Transform your meeting with a rich experience. Meeting organizers enjoy the familiar interface, and IT admins appreciate the easily deployed and managed meeting app.